Keep your water heater up and running with Master Plumbing! Your trusty water heater has quite a bit of responsibility in your home. If you’re like most homeowners, you probably don’t really give it much thought. Well, until it starts malfunctioning. 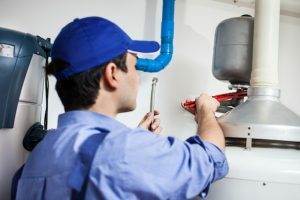 When your water heater needs servicing or replacing, there are usually some tell-tale signs. If you see any of these, call Master Plumbing right away! As a homeowner, it is essential that you know how old your water heater is. You can find this information by checking the serial number somewhere near the top of the unit. It should be a letter followed by a string of numbers that appears to be random. As an example, let’s say the serial number is H083139674. The “H” represents the month. H is the Eighth letter of the alphabet, so that means the 8th month of the year which is August. The next two numbers, which are “08” tell you that this particular appliance was manufactured in 2008. Different manufacturers have different ways of numbering their products, so if you’re unsure just check with the manufacturer to find out the age of your water heater. If it’s more than 10 years old, it should probably be replaced. Rust isn’t good in any part of your home’s plumbing system, and least of all in your water. If you notice that your warm water is a sort of rusty color or if there is actual rust in the water, this is a sign that there is rust inside the tank. As the rust progresses through to the outside of the tank, it can cause the unit to leak. There are all sorts of reasons for your pipes to make some noise now and again. If you hear rumbling or banging coming from your water heater, it’s a sign that the sediment at the bottom has hardened. It is perfectly normal for a water heater to contain sediment. However, when it starts to harden, that means that the appliance is not going to be with you much longer. This entry was posted on Friday, May 4th, 2018 at 8:52 pm. Both comments and pings are currently closed.